Amelia Roosevelt is a founding member of Repast Baroque Ensemble, which performs regularly in New York and tours nationally. Described by The New York Times as a “virtuoso duelist,” she performs with the Carmel Bach Festival Orchestra, the Washington Bach Consort, the Aradia Ensemble, the American Classical Orchestra, and Musica Sacra. She has toured throughout Europe, Scandinavia, and South Asia with many ensembles including Musica Antiqua Köln, Concerto Köln, and La Cappella de’ Turchini. Her many recording credits include Naxos, MDG, New Classical Adventure, and MSR Records. A New York City native, Amelia holds a doctoral degree in violin performance from Stony Brook University, further graduate degrees from the Manhattan School of Music and the Sweelinck Conservatory in Amsterdam, and an undergraduate degree with honors from Swarthmore College. She has given numerous workshops and master classes at universities including Rutgers, Columbia, SUNY Purchase, and Smith College. Amelia's baroque violin was made in London by Richard Duke in 1773. Katie Rietman has performed as a baroque cellist on over 45 CD recordings and numerous concerts and radio broadcasts with notable baroque and classical period instrument ensembles worldwide. Her performing career has taken her to 19 countries in Europe, North America and South America. Currently residing in New York City, she performs there regularly with ensembles such as the Clarion Society, Rebel, Concert Royal, the Trinity Choir and St. Thomas Boys Choir. Other American groups that she regularly works with are the Boston Early Music Festival Orchestra, Musica Angelica, Philadelphia’s Buxtehude Consort, Tempesta di Mare, Aradia and the Toronto Chamber Orchestra. She has coached baroque and modern string players at Yale University, Bard College, Catholic University of Peru, and University of Alabama. Praised for her “warmth and composure” (Wichita Eagle), bassoonist Stephanie Corwin enjoys a varied career playing modern, classical, baroque and renaissance instruments. Based in New York City, Stephanie performs with ensembles at home and throughout North America, including Handel and Haydn Society, American Classical Orchestra, Tafelmusik, Philharmonia Baroque, Apollo’s Fire, Trinity Wall Street, and her chamber ensemble Kleine Kammermusik. A graduate of Davidson College, Stephanie earned degrees from Yale (MM) and Stony Brook (DMA), where she studied with Frank Morelli. Her interest in early music led her to continue her studies at Indiana University, where she received a Performer Diploma in historical bassoons. During the 2018-2019 season Stephanie will make solo appearances with the Chamber Orchestra of New York (Carnegie Hall) and Apollo’s Fire (Cleveland). She can be heard on recordings with Philharmonia Baroque Orchestra, Handel and Haydn Society, Chamber Orchestra of New York, Indianapolis Baroque Orchestra, Apollo’s Fire, and Kleine Kammermusik. 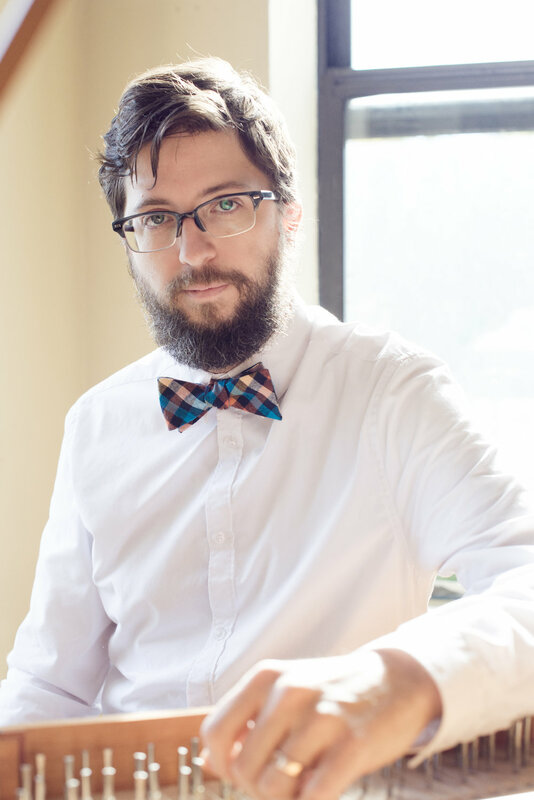 Harpsichordist Gabe Shuford performs throughout North America and abroad, and is the recipient of several awards, including the 2011 Baron Prize from Stony Brook University and second prize at the 2007 Mae and Irving Jurow International Harpsichord Competition. He is a member of Repast Baroque Ensemble and has been a frequent guest of others, including A Far Cry and the Chamber Music Society of Lincoln Center. The New York Times called his performance with Speculum Musicae of Elliott Carter’s Sonata “assured, polished and beautifully nuanced.” Gabe earned a doctorate from Stony Brook University, where he studied with harpsichordist Arthur Haas. He has served on the faculties of Luther College and Sarah Lawrence College. American-Uruguayan soprano Nell Snaidas began her career singing leading roles in zarzuelas at New York City's Repertorio Español. Specialization in Latin American and Spanish Baroque music has taken her all over Europe, North and Latin America. She has been invited to join many leading Early Music ensembles in the capacity of soloist, guitarist, and Iberian/New World language and repertoire consultant. These groups include Apollo’s Fire, The Seattle Baroque Orchestra, Ex Umbris, Ensemble Viscera, El Mundo, Chatham Baroque and at Music Festivals from the U.S., Canada, Mexico, and Italy, to Germany, Austria and Switzerland. She has recorded for Sony Classical, Koch, Naxos and Dorian (for whom she served as language coach and soloist on 3 Spanish/New World Baroque cds). Her latest cd as a featured soloist with El Mundo in this same repertoire has been nominated for a Grammy in the Best Small Ensemble category. Beth serves as the string coach for the baroque ensemble at SUNY Stony Brook, and has coached baroque ensembles at Rutgers University. She has become a recurring guest teacher at Oberlin Conservatory, teaching at BPI (Baroque Performance Institute at Oberlin) during the past two summers, as well as leading and coaching the conservatory's Oberlin Baroque Orchestra for the second time in 2019. A curiosity in the cultural background behind the music she plays led Sarah Stone to baroque cello and viola da gamba. This season, Sarah will be performing around the country with Seraphic Fire, Washington National Cathedral, House of Time, NYBI, Trinity Baroque Orchestra, and Repast. This past summer, she joined Teatro Nuovo in performing unconducted bel canto opera, and traveled to Portland, Maine, making music in unconventional venues as a part of The Portland Bach Experience. This coming season includes travel to Montana, performing Christmas Oratorio with Musikanten Montana across the state, as well as co-leading Bitterroot Baroque's Montana Cantata Project. Highlights of recent seasons have included performances of Bach cantatas with Trinity Wall Street in Montreal and a northeast tour with Apollo’s Fire including her Carnegie Hall debut. Sarah holds a Masters in Historical Performance from the Juilliard School, a Masters from San Francisco Conservatory of Music, and a Bachelors of Music from Rice University. Noted as “the compelling guitarist” by The New York Times, Arash Noori performs throughout North America and Europe on lutes and guitars as both a recitalist and accompanist. Arash has appeared in performances with Les Arts Florissants, Early Music New York, Orchestra of St. Luke’s, Piffaro: The Renaissance Band, the Sebastians, ARTEK, and NOVUS NY of Trinity Wall Street amongst others. He is a core and founding member of Cantata Profana, acclaimed for its “intrepid and unexpected concerts” by The New Yorker and the recipient of Chamber Music America’s Award for Adventurous Programming in 2016. Visit www.arashnoorimusic.com for more information.